The lecture is fascinating. Professor Harline addresses change, how successive generations adapt or expand the previous generations' values into new areas, and the conflict or consternation that causes in the older generations. He uses very effective examples, from society at large and from religion specifically, on how attitudes and beliefs have changed. For example, he points out that first century Christians would be either dumbfounded or horrified at many modern Christian stances including on slavery, the place and abilities of women, borrowing money, even what we call the first day of the week and when we worship. In one brilliant paradigm-busting bit, Professor Harline defines a hero as one who is willing to reconsider his or her own stance when changes occur, rather than retrenching and "doubling down" on the old way of doing things. Seriously fascinating stuff. I need to go listen to it again. 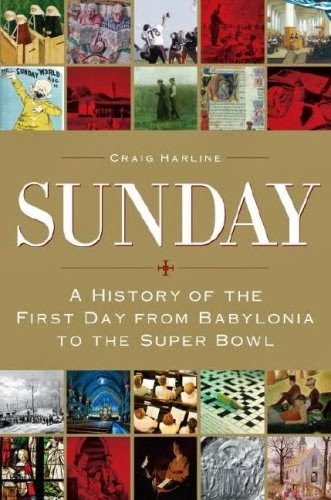 Anyway, in Sunday: A History of the First Day from Babylonia to the Super Bowl he narrows his topic to the changes that have occurred regarding this day of the week and the social and other influences that have affected those changes. In each of the seven chapters he focuses on a particularly pivotal time period for Sunday that illustrates how attitudes, beliefs, and behaviors were adapting. Starting with the ancient Middle East, where the seven-day week was first established, he brings us on a tour of the Jewish Sabbath (starting at sundown on Friday and continuing until sundown on Saturday) and the Hellenistic naming of days of the week by planets and celestial objects, including the sun, and then on to the Christian "Lord's Day" commemorating Christ's Resurrection on the first day of the week. Early on there were various ideas about what was appropriate activity for the Lord's Day, with some viewing it as a "transplanted Sabbath" demanding a very narrow definition of rest and others believing that as long as one worshiped on that day, anything else was fair game. The Council of Rouen in 650 was "the first church council explicitly to require a twenty-four-hour Sabbath-like Lord's Day, to make rest and worship obligatory, and to fix a list of penalties for violating rest." This strict interpretation gained popularity across the Christian world and became the expectation throughout the Middle Ages. The "prescribed mood was no longer one of outward joy, as in the ancient Sunday, but of inward joy. The outward mood, however, was one of somberness." The common people, particularly the peasants, resisted these limitations on their single day off during the week. Long, hard, back-breaking hours of physical labor for six days needed to be balanced with some fun and enjoyment on the seventh, they felt, despite religious leaders' threats of eternal damnation and more immediate punishment. Zooming forward several centuries to continental Europe in the throes of the mid-nineteenth century Industrial Revolution, Harline notes that "if the greatest threat to the old religious Sunday had long been excessive play, the greatest threat to Sunday after industrialization was excessive work." Perspectives shifted further during World War I, "The War to End all Wars", in the early twentieth century. Horrific battles were fought on Sundays, the same as every other day of the week. Sundays brought no rest from the fear and slaughter. "With thoughts so riveted on war, hardly anything else, including Sunday, mattered." But contrary to popular belief, the trend hasn't been all for the secularization of Sunday. During the early twentieth century there was an increase in opportunities for both work and recreation on Sundays and more Americans availed themselves of those opportunities, but at the same time, "Americans were also going to church in steadily increasing numbers. And while at the founding of the republic not even two in ten Americans belonged to churches, by 1950 six in ten did." Religous affiliation increased to seven in ten by 1960. Rather than a stark dichotomy of spiritual or secular, many people saw both aims as compatible. As Americans experienced changes in transportation, industry, urbanization, and leisure, they were bound to experience changes in their Sunday activities as well, and to see those activities in new way. Along the way morals were reconfigured, not lost...[A 1945 study showed] that between 1800 and 1940, each succeeding generation regularly saw once-condemned Sunday activities become accepted as 'normal' and 'traditional.' And this occurred in a context of increasing association with formal religion, not less. Harline's vignettes paint a detailed portrait of Sunday life during each time period, and he grounds them well within the context of larger societal, political, economic, and religious movements. The "Sunday question" has caused conflict for literally millennia now, but as Harline notes, "Sunday changed when the world around it changed" and it will continue to do so, adapting to each new challenge as it appears.